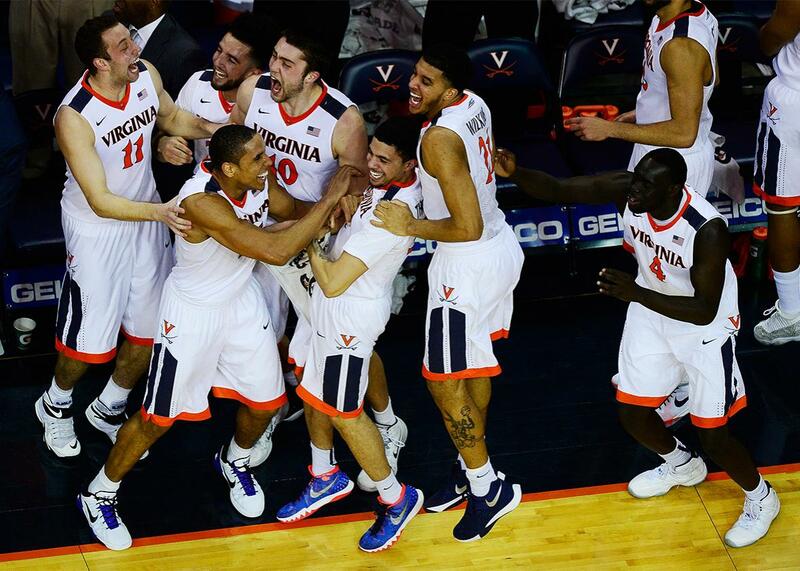 NCAA bracket picks, 2016: Why you should bet against Kansas and pick Virginia in your NCAA pool. The Virginia Cavaliers celebrate during their game against the Louisville Cardinals at John Paul Jones Arena on March 5 in Charlottesville, Virginia. A version of this article originally ran in 2009. In 2010, our advice to bet on Duke paid off when the Blue Devils won the title. Our suggestions to pick Texas in 2011 and Ohio State in 2012 did not go quite as well. (The Buckeyes at least made the Final Four.) Our 2013 pick, the Florida Gators, only made it to the Elite Eight that year, and Arizona—our pick in 2014 and 2015—also lost in the Elite Eight both years. Buyer beware! Before you start filling out your bracket, then, you need to choose some measure of team strength that’s free of biases and groupthink. Here, the bountiful Internet does not disappoint. Dabblers can choose from many different statistical measures—adjusted scoring margin, the Ken Pomeroy ratings, Jeff Sagarin’s computer ratings—that rank teams based on factors like strength of schedule and margin of victory. Other services, like Team Rankings, charge a fee for rigorous analysis, factoring in the results of real games between similar pairs of teams, the distance from each team’s home campus, and so forth. Again, your overall strategy should be to look for situations where the national bracket values a team much higher than the objective statistics. (I should stipulate that all of this advice assumes standard NCAA pool rules, where the points for a correct guess double each round, from one point in what the NCAA calls the “second round” to 32 for the final game.) For example, at the moment only 4.5 percent of all the participants in ESPN’s Tournament Challenge have picked Virginia to win the tournament—the right-most column on this table. Pomeroy’s log5 analysis of the tournament, by contrast, gives the Cavaliers a 13.2 percent chance of winning it all, giving them the second-best odds after favorites Kansas. This makes Virginia a decent bargain—while cold-blooded, numerical analysis gives the Cavaliers a roughly 1-in-7.5 shot at the title, only 1 in 20 people have picked them to win. As such, Virginia is the most undervalued asset in the 2016 NCAA Tournament. On the other hand, Kansas and Michigan State—the top two picks on ESPN.com—are not a bargain at all. In fact, the Jayhawks and the Spartans are both overvalued by the crowd. While 23.8 percent of ESPN users like Kansas, Pomeroy’s log5 analysis gives them a 15.2 percent shot; Michigan State (who could face Virginia in the Elite Eight) is the pick of 20.8 percent of ESPN’s bracketologists and has just a 11.9 percent chance of winning it all by Pomeroy’s metrics. Biostatistician Bradley Carlin, who co-authored a 2005 paper on contrarian strategies in NCAA brackets, suggests a “champion-only” technique. While most people spend a lot of time puzzling over potential first-round upsets, the mathematical reality is that it’s difficult to win a pool without securing those boffo championship game points. The payoff for risk-taking also increases in later rounds. Consider the first-round game between No. 13 seed Stony Brook and No. 4 seed Kentucky. Just 5.9 percent of ESPN players predict that the Seawolves will pull off the big upset while Pomeroy gives the school a 16.8 percent chance of knocking off Kentucky. On paper, that differential looks like a good bargain. But consider that this upset will reward the lucky Stony Brook backer with a mere one extra point in a standard office pool. If Kentucky wins, Seawolves supporters are suddenly missing an important player in the bracket. Other than Virginia, there’s one more decent bargain in this year’s field. If you don’t like the Cavaliers, go with the Villanova Wildcats. Though No. 2 seed Villanova has been picked to win the title by just 2.4 percent of ESPN.com competitors, the Wildcats have a 7.2 percent title chance according to Ken Pomeroy. West Virginia is also slightly underrated by the crowd, with ESPN.com users giving the Mountaineers a 1.6 percent shot to win while Pomeroy has the them at 4.4 percent. Another long shot that could come in (but probably will not): Oregon (3.4 percent on ESPN.com; 4.7 percent from Pomeroy). Who are the worst bets in the field? Other than Kansas and Michigan State, you’ll get crummy value by backing a pair of blue bloods: North Carolina (16.7 percent on ESPN.com; 10.3 percent from Pomeroy) and Kentucky (5.3 percent on ESPN.com; 3.6 percent from Pomeroy). Read more of Slate’s coverage of the 2016 NCAA Tournament.